(Jayapura) Indonesian security forces have arrested several people in West Papua today as demonstrations were held to commemorate the 51st anniversary of the original declaration of West Papua’s independence. Victor Yeimo, the Chairman of the West Papua National Committee, has been confirmed as being arrested by police, according to independent witnesses and direct communication with his brother. It is currently unknown if Yeimo was arrested by the Australian funded and trained Detachment 88 counter-terror unit, who had committed to hunt Yeimo. Several other people have been confirmed arrested jointly by Indonesian military (TNI) and police outside the headquarters of TNI battalion 752 at Expo Waena. The two confirmed detainees are Usman Yogobi and Alius Asso, according to West Papua Media stringers at the scene. More names will be provided as soon as confirmed. Major rallies were also held in Melbourne (Australia), and were planned to be held in Sorong, Nabire, Fak Fak, Manokwari, Wamena,, Timika and Serui. Information from these rallies have not yet been forthcoming. More to come – please stay tuned. The police chief of the district of Mimika, Jeremias Runtini has called on the people to ‘remain calm’ as1 December approaches. He said that people should act together to safeguard security and public order and should avoid getting involved in activities that tend towards subversion such as flying the Morning Star flag. 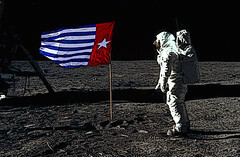 He said that to mark its anniversary, the OPM, Organisasi Papua Merdeka, the Papuan Freedom Movement, usually flies the Morning Star flag and other people join in this as well. ‘There is nothing special about 1 December,’ he said, adding that the police and the military will be patrolling the area, after mustering their men on Timika Indah Square,’ he told journalists, as 1 December approached. He told journalists that during the three days approaching 1 December, the police will be at the top level of readiness during these three days. The Central Body for the Fellowship of Baptist Churches are very concerned about Indonesian security forces towards God’s people in Papua. 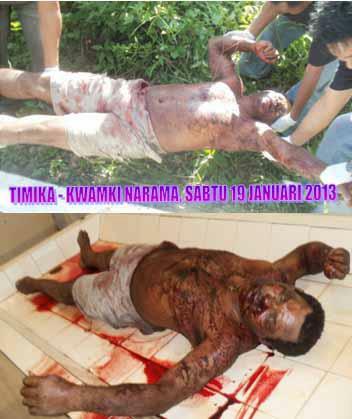 The cause for this concern came after General Kelly Kwalik killed in Timika on December 16, 2009 by Joint TIM – TNI, Indonesian Police, BRIMOB and Detachment 88, and Musa Mako Tabuni, Chairman of the West Papua National Committee (KNPB) were killed by Detachment 88 on June 14, 2012 at Waena, Jayapura, Papuans are confronted with strange and uncivilised events such as a bomb discoveries, bombings, and the arrest of Papuan civilians on suspicion of possessing ammunition throughout the entirety of Papua. 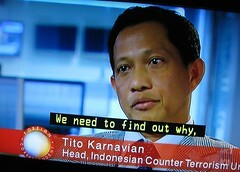 the discovery of three bombs in Manokwari on October 9, 2012. Explosion of three homemade bombs in Sorong on Sunday, October 28, 2012 at 22.00. As of October 30, 2012 there has been the discovery of 7.62 calibre ammunition in as many as 9 points, 5 TJ 5.6 bullets in as much as 121 points, 5.6 servant bullets in 20 points and the arrest of four youths known by the initials DIH (26), a resident of Organda, YP (28), a resident Sampan Timika, AK (24) a woman, a resident of Organda, and YJW (27) a Karubaga citizen. (Cenderwasih Pos News, Wednesday, October 31, 2012). On Wednesday, October 31, 2012 and the Papua Regional Police arrested a civilian with the initials OG (27) for the alleged possession of Jayapura PTC ammunition. A systematic effort to make the peaceful struggle for independence of Papuans become known as “terrorists”, so that the international community does not support the struggle of the people of Papua, and the Indonesian security forces instead become supported with funding from the Government of the United States and Australia, which has been instrumental in training and sponsorship of Detachment 88 to fight against “terrorists” in Indonesia. All ammunition and bombs which have been found and detonated were not owned and operated by indigenous Papuans, but there are several false owners, suppliers and urgers of young Papuans to give truth to the “justification” that those involved in the struggle of the people of Papua are in fact criminals and “terrorists”. 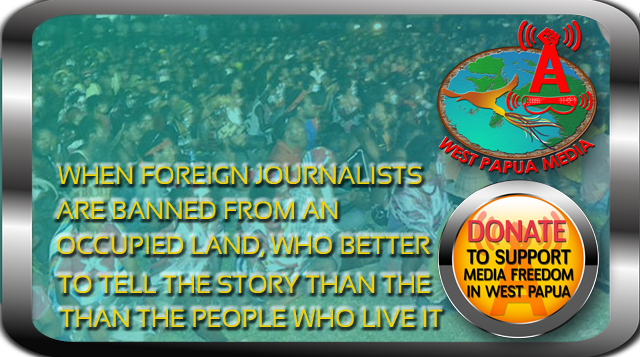 The entire Papuan society, migrants and indigenous Papuans, do not easily believe that the bombs which were detonated and found, and ammunition recovered from the hands of indigenous Papuans is not true. because the struggle to find justice and political rights for the people of Papua is found through peace, which has already been shown to be true, and not through violence, which would only be a backwards change. The security forces of the Republic of Indonesia must stop committing crimes against humanity by an engineered situation of bombs and ammunition discovery at the houses of indigenous Papuans. Immediately release all political prisoners such as Filep Karma, Forkorus Yaboisembut and friends unconditionally. Immediate withdrawal of all non-organic troops, which are not balanced by the number of indigenous Papuans. The Government of the Republic of Indonesia immediately allow access for foreign journalists and humanitarian workers to visit Papua. The Government of the Republic of Indonesia immediately inviting and allow the United Nation Special Rapporteur to visit Papua.